Easter in Queensland often brings memories of wet tents, flooded camp grounds, an early desertion of Stradbroke Island and generally pretty miserable conditions. The last few years have been nothing short of glorious so the odds were that the weather would throw a wobbly. The welcome rain sprouted fairy rings and made it easier to remain inside and not mull over what might have been on Big Woody Island. Three days of jerking wires and moving office in an already tight space had us fanging out for a watery reprieve. 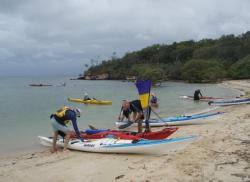 By the time we got back online all bar one of the group had changed to a Raby Bay start. 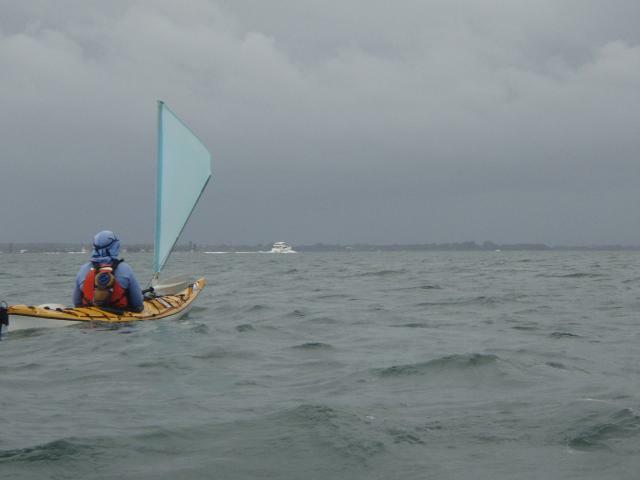 Wanting a day with a difference we stayed with our plan to paddle from Wellington Point to Peel Island. 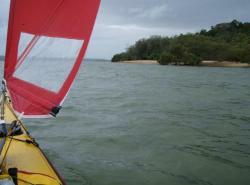 The forecast was fixed on a 10-15 knot easterly with a suggestion of a northerly touch. 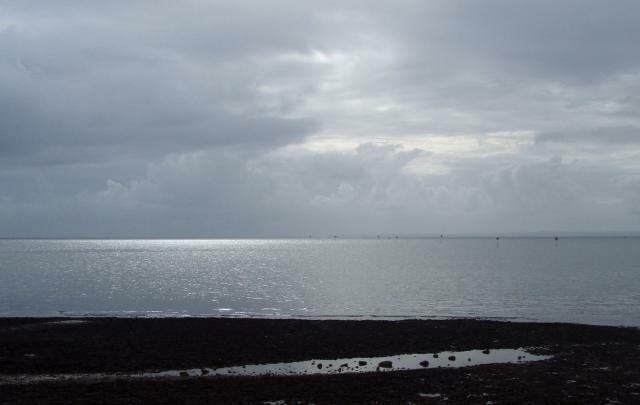 While clouds said that the wet had not finished, the skies were lighter in the east. When it was definite that neither Dean or Ray were turning up we headed out into the constant breeze - right on the nose. The chop was small and the bay was pretty much deserted. 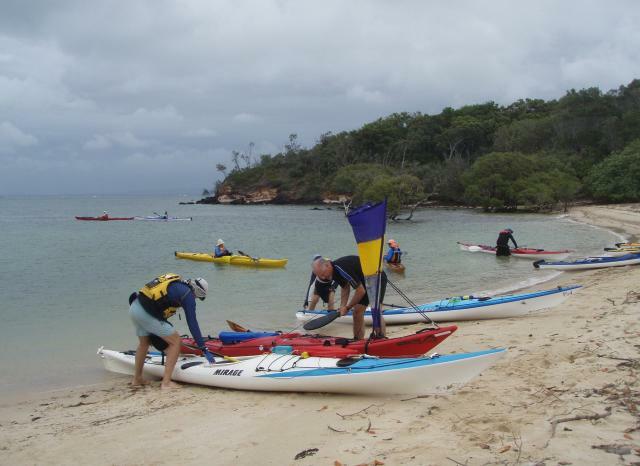 A call out to the rest of the starters leaving from Raby Bay went with the wind which was starting to firm up, turning the paddle into a gym exercise. By the northwest corner of Peel I had had enough of the unrelenting breeze and was well and truly ready to fly the sail. Turning the corner we sailed by the inviting beach on the eastern side of Peel where a sheoak and a hibiscus provide a beautiful canopy for a tent. Others have thought so too and the place is marked by a National Parks no camping sign. Approaching from the eastern side kayak colours nosing above the remaining stone wall jetty marked Platypus Bay. 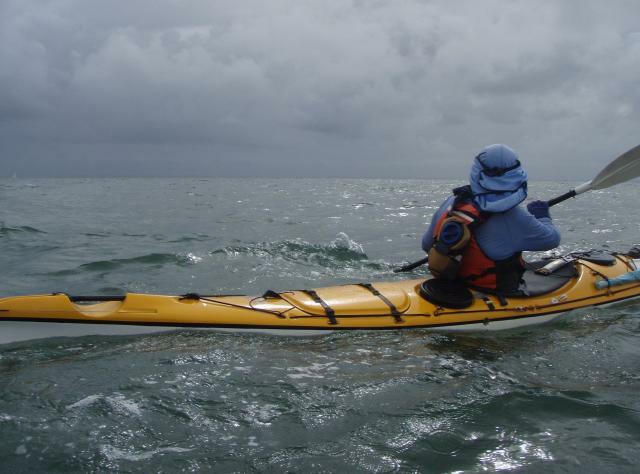 By the time we pulled in the rest of the group were ready to head off. We were greeted by a most welcome piece of Carol's walnut cake, made even more precious by her having to fend off Dave and piker. Really, Dave I thought you would have known better to get between me and my food, let alone a treasured piece of Carol's gourmet cake. As for piker, (now known as pikelet for not turning up at Wellington Point) you don't know what you are messing with - even Mark doesn't take me on when it comes to food. A couple of tinnies traded places with the group. After a welcome lunch (less the watermelon) we rested in the shade and waited for the sheoaks to announce that there was sufficient wind to blow us back to Wellington Point. The easterly held but didn't change much. It was enough to have us travelling easily at 11kph, tipping 14kph with the bit of swell which was around. Another 5knots would have been superb. We were monstered by enormous launches with three to four levels of deck and noisy diesels pushing up the largest swell of the day. The only launches out were huge and stupendous and by the sound of the engines, likely to be on their annual drive down to the Gold Coast for a couple of days of the casino and restaurants. Ick. 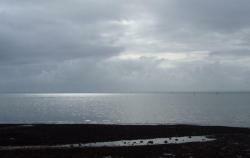 As we approached Wellington Point the black clouds that had the intensity of a thunderstorm now started to sound like one too. Not very comforting when there are no yachts within cooee to take the hit. Then the rain washed out most of the wind. By the time we pulled up onto the ramp the carpark was very wet and everyone was perched under the shelters. The day looked like it was shutting up shop early as it remained as grey as ever bringing to a close a weekend of classic Easter weather.